The 2018-19 scripture reading schedule is available for download! This guided reading schedule takes you through all the scriptures in one year with focused study and discussion on Natan's blog. Each day of the schedule gives you a reading from each of the four sections of the Bible: the Law (Torah), the Prophets (Neviim), the Writings (Ketuvim), and the Testimony of Yeshua (NT). 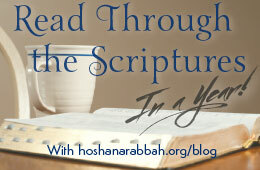 This way, each day, you get a balanced dose of YHVH's Word as you read through the Bible, beginning to end. The books of the Bible are arranged in their original, inspired order. As you read through the weekly Torah readings, you can also use either or both of Hoshana Rabbah's (adult or youth) Torah study guides to help you to understand the Torah in the full light of the gospel message as presented in the Testimony of Yeshua (New Testament). If you'd like to midrash with us during the week, join us on the Hoshana Rabbah Blog: Midrash with Natan Lawrence. Each week's scripture readings are posted at the blog on the first day of each week. Then let each of us bring to YHVH's banqueting table the sweet tidbits, truffles, bonbons, and priceless nuggets and pearls that we discover in his word for our mutual delight. At the blog, you can also sign up as a subscriber, so that each fresh scriptural insight that Natan posts will automatically be emailed to you. Phinehas, the grandson of Aaron the high priest, thrust a spear through Zimri the Israelite man and Cozbi the Midianite woman as they were bringing the curse of YHVH upon the nation of Israel by fornicating with each other within the camp of Israel. With the same righteous zeal as Phinehas, today’s righteous spiritual leaders must rise up and stand against secular philosophies that threaten to bring YHVH’s judgment upon redeemed Israel. In the face of evil in his day, David asked, “Who will rise up for me against the evildoers, or who will stand up for me against the workers of iniquity?” (Ps 94:16) The present issue relates to the dangerous and damnable trend within the body of redeemed Israelite believers to question and even deny the deity of Yeshua. The biblical calendar is a potentially confusing, even daunting issue. In a clear and concise manner, this article will demystify this otherwise complex subject. You need to insure that you’re celebrating YHVH’s biblical holidays according to his time schedule, and not according to the traditions of men. He commands his people to observe them forever, for they are divine appointments when he promises to meet with his people. It is then that he will teach men about the seven steps in his plan of redemption or salvation for mankind, including the deeper mysteries of the gospel message. These are a few of the reasons why having the correct calendar is so important. This is why you need to read this informative article, “The Biblical Calendar Demystified”. In the twenty-third psalm, Elohim promises to lead us in the paths of righteousness. What are these? We had better know, since elsewhere Scripture tells us that the unrighteous will not be in the kingdom of Elohim, and then at the end of the Bible, we are told that the bride of Yeshua is clothed in robes of righteousness, which are the righteous deeds of the saints. What are these deeds? How do we become righteous and then stay righteous? What is true righteousness versus pseudo-righteousness? In the new article “Lead Me In The Paths of Righteousness", we present the biblical answers to these questions. Many in our day with joy are rediscovering the Hebrew roots of their Christian faith, which includes coming to a knowledge of the biblical feasts. But to keep these feasts "at their appointed times," one must have a basic understanding of the biblical calendar including knowing when the month begins. We discuss this subject in the article, "The Biblical CalendarNew Moon: Visible or Conjunction?” so that you can be absolutely certain that you're celebrating the Creator's feasts according to his instructions. The Bible teaches us that to understand where you’re going, you must first understand who you are and where you’ve come from, and that the key to gaining your spiritual inheritance is in understanding your spiritual heritage. We will identify who the descendants of Ephraim became and what amazing things biblical prophecies declared would happen to this people-group in the end times. Because of spiritual apostasy, the descendants of Ephraim were scattered to the four corners of the earth with a large number of them ending up in North America. The prophecies of the Bible describe America geographically, politically and historically. The Bible describes America’s political, economic and military greatness. America’s arch-enemies in the end times will be the Islamo-Facists nations and their communist allies; Elohim will use America’s enemies to bring it to its knees spiritually. America’s fall from greatness is a necessity for its repentance and spiritual revival. That revival will occur just prior to the second coming of Yeshua (Jesus) the Messiah. America and the nation of Israel will have a special brotherly relationship and together they will defeat their mutual enemies. America’s and Israel’s victory will result in helping to prepare the way for the return of Yeshua the Messiah, the return of the lost ten tribes of Israel to the Promised Land as prophesied in the Bible, and the unification of Jews and Christians under the kingship of Yeshua. Read this article: "Is America in End-Time Bible Prophecy"
Some may consider the subject of the identity and return of the lost ten tribes of Israel to be a controversial if not a taboo subject. The reason for this is that over the years some authors have developed some ingenious, sometimes wild speculations and even racist ideas pertaining to this subject. We want nothing to do with such nonsense! In this brief treatise, we will examine some of the voluminous writings of the biblical prophets on the subject of the lost sheep of the House of Israel, and review what the Jewish rabbis, in line with the biblical prophets, have written on this subject over the centuries. Furthermore, we will look at linguistic, historical and archeological evidence from some of the world’s leading scholars on these subjects. After examining the evidence, you make up your mind as to what happened to the lost ten tribes of Israel and whether they will return to the land of Israel in the last days to fulfill biblical prophecy. The New Testament Canon: Divine Origination From the 1st Century or of Catholic Church Origination in the 4th Century? The Messianic Scriptures/Apostolic Writings (New Testament) are under fire. Prominent Messianic teachers are currently questioning if the 27 books in the NT are all inspired or not. Others are questioning whether the Church fathers and Catholic Church “messed” with the original writings leaving us to doubt whether we can trust them as the truth or not. In confusion, some Believers have even turned away from the Gospel message and denied Yeshua figuring the New Testament is, to one degree or another, a man-made religious lie. What is the truth? When was the New Testament canonized and by whom? Did YHVH Elohim leave his priceless Word hanging in the balance for hundreds of years only to finally have a Torah-denying and swine-eating paganized Church choose what would be Scripture or not? We will produce substantial scholarly evidence that flies in the face of most Christian theologians who seem to support the party line of the self-justifying and self-exalting and self-substantiating Church system that says that it was the one who established the New Testament Canon through its Church councils and edicts. We will show evidence from the Scriptures themselves and from historical records that Yeshua commissioned certain apostles to canonize what would later become known as the “New Testament” Scriptures. This series of lectures will strengthen your faith in the inspired Word of Elohim as preserved in the 27 books of the Apostolic Writings, in the Gospel message and in the Person, Redemptive work and deity of Yeshua. You will also have the tools to defend your faith and to help those who have fallen under the sway of false teachings questioning the divine inspiration of all of the Messianic Scriptures from Matthew to Revelation. Can You Trust the New Testament Scriptures as YHVH’s Divine Word? Is the “New Testament” the Divine Word of YHVH? If you are not saved or not sure, click here and then here. The first sliver of the crescent new moon for the 1st month was seen by one possible witnesses in the land of Israel the evening of 4/06/19. It was cloudy and this was the only reported sighting. However, they did not want their name published, they were a single witness without confirmation, and that left us in the position of hearing a rumor. We believe that makes 4/7 the new moon as the barley is aviv. For an explanation of our opinion of the aviv barley reports for the previous month, please see our blog. 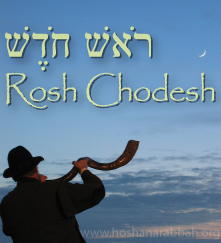 Rosh Chodesh for the 2nd month is anticipated to be seen on the evening of 5/06/19. We are no longer gathering as a congregation for Shabbat Services. After 18 years, Natan & Sandi are retiring from pastoring Congregation Elim and hosting feast celebrations. We will continue providing the website ministry, blog, Scripture reading schedules, and calendars. Our attention will now focus on updating the Torah Studies, Torah Explorers, articles and website, continuing to share these materials and resources without charge. There are continuing expenses and your financial support is appreciated to keep these materials and resources free for everyone to use. Protected by anti-spam filters. Expect an automatic return e-mail from our filter service that you must respond to for your e-mail to proceed through to us. Please add us to your filter's allowed senders list so that you can receive our response. Does NOT receive text messages.